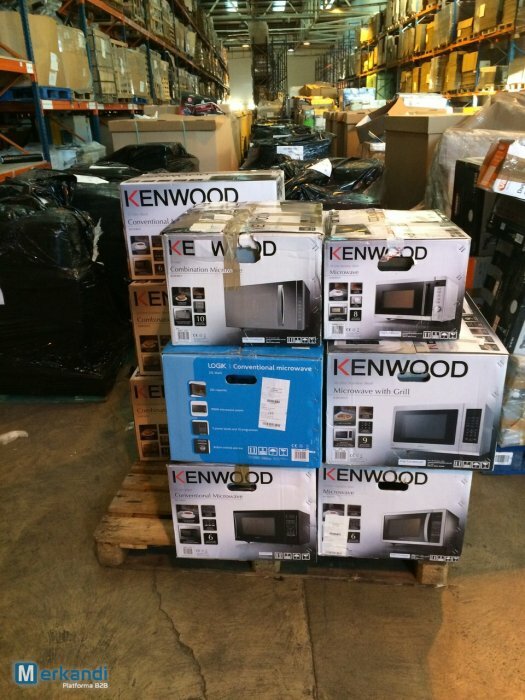 Large wholesale lot of microwaves is available to buy from UK wholesaler. Since these are untested wholesale microwaves, the stock is sold without any warranty, on a “as is” basis. We have no manifest, but according to the pictures sent by the UK wholesaler, most of the stock are Kenwood microwaves. Nonetheless, there might be some other microwaves too, so You might ask him about the other brands, if You are interested in buying this lot. None of these microwaves has been tested for working, and that’s why they are not offered for sale under any warranty. The reason is obvious: the lot includes untested customer returns and store or warehouse damages. To this end, please mind that this is a take all deal. The UK wholesaler is not interested in selling this stock in smaller quantities, and will only accept the offer on the total available amount of these microwaves.